...Arianespace’s October 12 Soyuz flight from French Guiana have been integrated on their payload dispenser, marking another key step in the preparations for this medium-lift mission. Galileo FM3 and its FM4 co-passenger were installed on the dispenser system, which then will be encapsulated in the Soyuz payload fairing. The two-piece fairing was transferred yesterday from a storage area for Soyuz components at the Spaceport, readying it for the encapsulation operation. 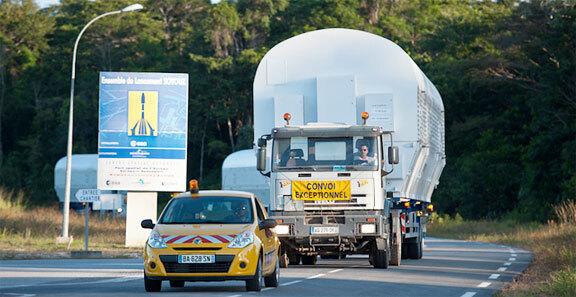 Payload fairing elements for Arianespace’s VS03 Soyuz flight are transported at the Spaceport for their encapsulation with the mission’s two European Galileo satellites. The dual-payload dispenser for Galileo was developed by RUAG Space Sweden for Arianespace, and carries the satellites in a side-by-side arrangement. It will deploy the spacecraft by firing a pyrotechnic separation system to release them in opposite directions at the orbital insertion point. After being lofted by Arianespace’s third Soyuz mission from French Guiana—which is designated VS03 in the company’s numbering system—these two Galileo spacecraft will join another pair of similar of European navigation satellites orbited on the Soyuz launcher’s historic maiden Spaceport flight, performed on October 21, 2011.